The importance of blood vessel formation (angiogenesis) for the local growth of solid tumors and their metastatic spread is well established (1,2). 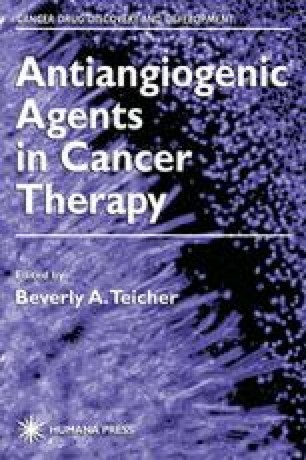 A large series of correlative clinical studies published by different groups over the past seven years showed that the number of blood vessels detected in a primary tumor is an independent prognostic indicator of the outcome of the disease and is directly related to the rate of metastasis of tumors of different origin, such as breast cancer (3–8),nonsmall-cell lung cancer (9), prostate cancer (10), squamous cell carcinoma of the head and neck (11),and melanoma (12,13). In general, these studies showed that the numbers of blood vessels in a given primary tumor specimen is indicative of the rate of metastasis of the respective tumor and gives an independent measure of the outcome of the disease. Of additional significance are reports that in breast cancer patients with estrogen receptor (ER)-positive tumors, and hence apparently good prognosis, high microvessel density in the primary tumors seems to predict poor clinical outcome (8).